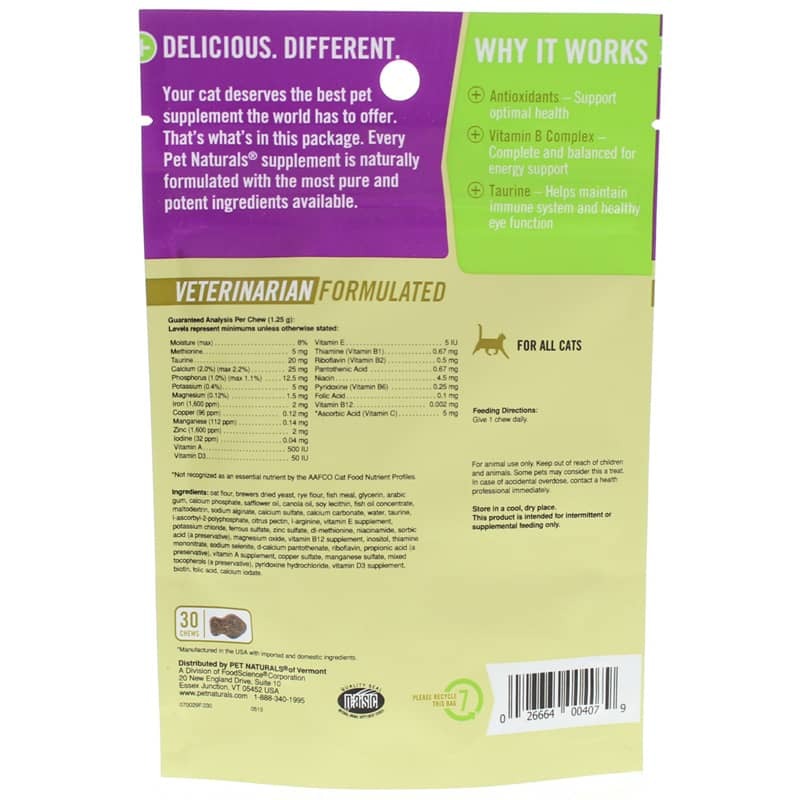 Daily Multi for Cats by Pet Naturals of Vermont is a multivitamin with over 20 healthful nutrients that's designed to help keep felines of all ages in optimal condition. Ships tomorrow if you order in the next 22 hours 40 minutes. Our cats mean the world to us, so we want to do everything we can to keep them around for as long as possible. That's why Pet Natural of Vermont created its Daily Multi for Cats - to make it easy for us to give our beloved felines the nutrition they need for optimal health. This formula includes taurine, an essential amino acid that companion cats need, antioxidants, vitamin B complex, vital minerals, essential fatty acids and much more! One treat is all you need for any age, size or breed. 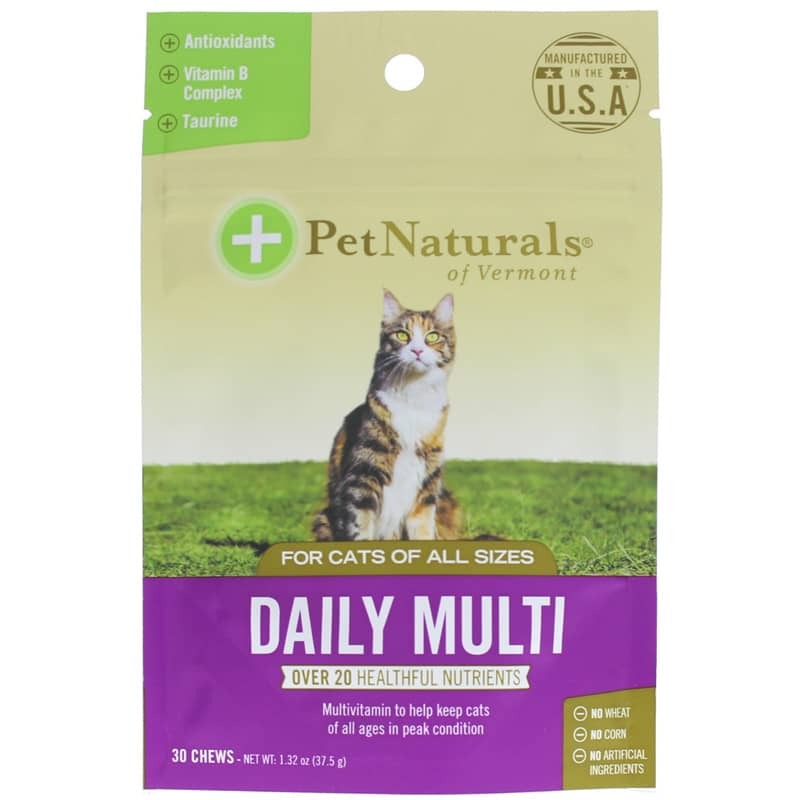 If you're looking for a complete multivitamin for your companion cat, consider Daily Multi for Cats from Pet Naturals of Vermont. Ingredients: oat flour, brewers dried yeast, rye flour, fish meal, glycerin, arabic gum, calcium phosphate, safflower oil, canola oil, soy lecithin, fish oil concentrate, maltodextrin, sodium alginate, calcium sulfate, calcium carbonate, water, taurine, l-ascorbyl-2-polyphosphate, citrus pectin, l-arginine, vitamin E supplement, potassium chloride, ferrous sulfate, zinc sulfate, dl-methionine, niacinamide, sorbic acid (a preservative), magnesium oxide, vitamin B12 supplement, inositol, thiamine mononitrate, sodium selenite, d-calcium pantothenate, riboflavin, propionic acid (a preservative), vitamin A supplement, copper sulfate, manganese sulfate, mixed tocopherols (a preservative), pyridoxine hydrochloride, vitamin D3 supplement, biotin, folic acid, calcium iodate. For use in cats only. Keep out of reach of children and animals. Your pet may consider this a treat. In case of accidental overdose, contact a health professional immediately. Store in a cool, dry place. This product is intended for intermittent or supplemental feeding only. my cat is extremely allergic so this is the only brand of vitamins he can take.